This story is about Clara, a teenage girl who lives in a dysfunctional family. Her divorced parents live in the US and France with their new partners. Clara’s mother is an ageing ballerina, who has an eating disorder that has led to osteoporosis. She has raised Clara to have an unhealthy obsession with food and food restrictions. There is a particularly pathetic description of Clara feeling too guilty to secretly keep even one of her Halloween candies, which her mother has trained her to throw down the garbage chute, after she has gone door-to-door in her costume. 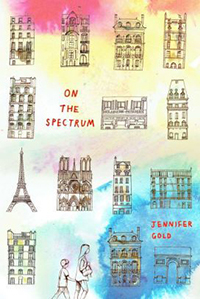 Clara moves to Paris, France for the summer to be with her father, stepmother and ten-year-old stepbrother, Alistair, who is on the autism/Asperger’s spectrum. Gold paints a picture of a child who is “neurotypically different,” exhibiting lack of interpersonal skills, taking things literally, having no verbal filter and being easily overwhelmed by noise, smells, small spaces, heights and crowds. Finally, to round out the summer cast, there is Michael, a black ethnic Angolan baker, who becomes Clara’s boyfriend. Usually being “on the spectrum” refers to autism/Asperger’s, but Gold is trying to point out that eating disorders also exist on a sort of spectrum. She uses Alistair’s bluntness as a socially acceptable method of commenting on facets of eating disorders. She arranges to have the most uncomfortable comments and pointed questions come from Alistair’s mouth. While the depiction of autism/Asperger’s is accurate and even Clara’s seemingly intuitive knowledge of how to manage Alistair is believable, Michael’s “helping” Clara with her eating disorder is less so. Through the arc of the story, Clara comes to acknowledge that she has an eating disorder. However, that this should result simply from the encouragement, and sometimes annoyance and disappointment of a new boyfriend is unrealistic. Were it that simple, eating disorders would have been cured long ago. However, this novel does give readers an opportunity to explore two mental disorders in a sympathetic way. Recommended for public libraries and junior high and high school libraries.